Rockstar: Old wine new bottle romantic saga with music as backbone. 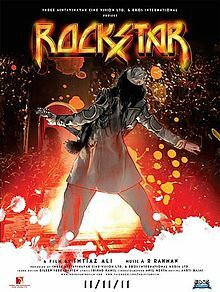 From the maker of “Jab We Met”, “Love Aaj Kal” and “Socha Na Tha” (Abhay Deol – Ayesha Takia starrer unnoticed gem) and writer of “Ahista Ahista” (Abhay Deol – Soha Ali Khan, a beauty) comes once again, the much hyped and anticipated Ranbir Kapoor’s in and as “Rockstar”. First things first, Rockstar is not about music, it’s about love. A love that is pure passion; A love that needs more of feelings and emotions rather than modern life logical conclusions and reasoning. The movie is all about Imtiaz Ali style romance, where a lover is drifted along with the highs and lows in a beautiful cinematic journey. Rockstar is thus, much about love and a little about music. Am I complaining? No, not at all. Let me bluntly state the problem first: Editing in second half and open-ended story telling. These are the only goofs in Rockstar and it seems that Director wanted to keep it that way only. That is why Rockstar is classy! The slick screenplay manages to portray flashbacks with style, but this can get a layman confused at places. The abrupt ending over which, I will write a whole article soon, may disappoint the popcorn people. That is why I said, Rockstar is classy not massy. To overcome all the goofs, we have Ranbir and Rahman. Ranbir has proved with this movie that he deserves to fix in the slot of top Bollywood actors. He single-handedly manages to lift up the whole movie and takes it to another level. This is the role of a solo hero, which is yet not done by Imraan Khan or John Abraham (Shahid did it in Kaminey, BTW). Ranbir deserves accolades from people as well as critics. He should win some awards or at least nominations for Janardhan Jakkar a.k.a Jordan and a.k.a JJ. His character is an open diary, something easier to read, tough to understand. And how Janardhan turned to Jordan, that journey, is cry of an anguish by a rock star. Rahman did it once again! I found his songs the bliss in second half (the couple next to me found it bore!). What’s more? Nargis Phakri in a hot-cool avatar, eye candy locations of Kashmir, Prague, Delhi etc. thanks to brilliant cinematography. And an ending that needs guts. UPDATE: Re-rated the movie as the first five star movie on Bollywood Dil Se. I didn't want to regret later. I know the movie is not perfect, but lets keep it as it is. The article on Rockstar's ending is done. Click Here! Brilliant performances! Ranbir, Shammiji, Piyush Mishra, Aditi Rao Hydari all are outshining. Kumud Mishra and Shernaz Patel are noteworthy. Story and screenplay are flawed but yet intriguing. Dialogues are bang on and will be remembered easily. As said earlier, ending is uncanny. Editing is brilliant in parts but somehow gets loose in second half. Aarti Bajaj's cinematography is first rate. Imtiaz Ali, you did it man!! The critic which rates it poor has no right to judge love stories (personal point of view, sorry if that was rude)! I rate it a five! Rockstar will not find it tough to recover its money. Hit! this muvie is not for aam janta...I accept..I thus did not find it g.
For me...this Movie is a sheer piece of genius poetry...! I wished for long after that somehow I could reach to Imitiaz...Ranbir...and Rahman...to convey them that they created a pure masterpiece...! Does anyone review the posts on this blog at all..?